Once you’ve created your audio podcast, there’s one step before you release the podcast, and that’s adding a few tags to the audio file. These are bits of information (text and images) that are embedded in the MP3 file. Tagging an mp3 file adds extra information that helps the listener, and helps identify the podcast when it’s been downloaded and played. Our tool of choice is the excellent MP3Tag, which is free! 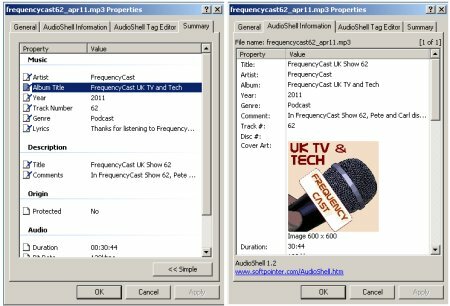 If you’re a Windows XP user, then there’s a must-get tool to allow you to tag your podcast – AudioShell. Install it, and then when you right-click on any MP3 file, you can edit the file’s ID3 meta tags. All of the important podcasting tags are supported. We explain how to find good podcasts, how to listen, and how to make your own.